Pallet rack inspection and safety is an important part of any warehouse or distribution center. UNARCO pallet rack repair kits are welded to stringent factory standards to improve functionality and safety of any manufacturers’ rack product. Replace damaged pallet rack frame areas with parts directly from the manufacturer approved through UNARCO engineering and design. Pre-Engineered or custom designed pallet rack repair kits that are reinforced with double columns and closed-tube posts to be inherently stronger and more durable than the original upright. 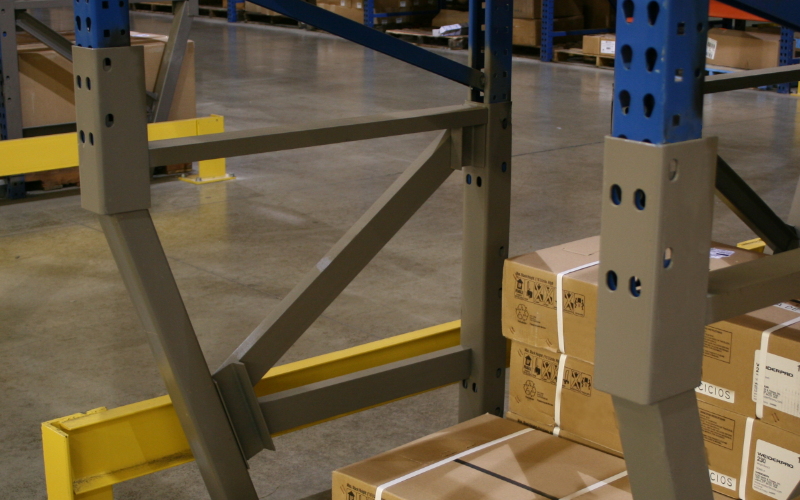 Take advantage of UNARCO pallet rack repair innovation with sloped-leg uprights which provide additional aisle clearance from forklift/reach truck impact. Accidents happen in a warehouse with daily forklift movement and product placement. Protect yourself by taking the lower part of the upright out of harm’s way from reach truck traffic. UNARCO pallet rack repair kits are compatible with any pallet rack manufacturer and come in a bolt-on or welded options specifically engineered for your warehouse. Repair kits come with all hardware needed for pallet rack attachment and are available with durable 1/4″ thick steel straddle protectors and column protectors pre-welded or shipped for onsite bolt-on assembly. Let UNARCO’s team of qualified engineers survey your warehouse and provide a quote for engineered pallet rack repair kits using qualified, approved installers specialized in the industry for pallet rack repair kit installation. website load testing tool .